Amenities: The Diamond Terrace condos offer a gym, roof top deck & BBQ area with direct views into the ball field. Other: Diamond Terrace is one of the closest condo buildings to Petco Park (home of San Diego Padres baseball team). Some of the units facing South have direct views into the ball field from inside the unit (not leaning over the balcony like the ones facing West). 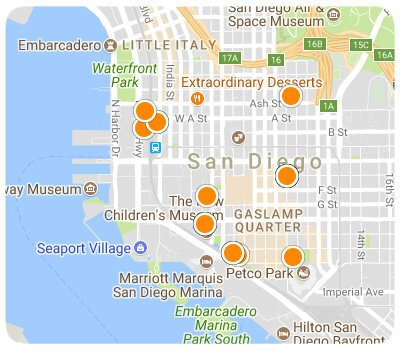 Like the most: Diamond Terrace residents have conveyed to me they like the convenient location next to the ball park (Petco Park) and being close to the Gaslamp. They also feel the common areas are maintained well. Like the least: The common complaint among almost all survey respondents Diamond Terrace condos was noise, too much of it from the neighbors including noise in the hallways etc. Residents are also disappointed the building does not have swimming pool. Although no resident mentioned the noise from specifically coming from Petco Park I imagine the low rating in the noise category come partly from the firework noise often occurring during or after baseball games. Other comments: Diamond Terrace residents feel the building is too expensive for what you get and that there are better places in downtown for the money.